Finding time to make a home cooked breakfast can be tough…really tough! Especially when you’re bleary-eyed, trying to make sure your socks match and get out of the door on time. And as much as many of us love a warm bowl of tender, creamy and delicious steel cut oats, who has an extra 30-45 minutes to make it? I know I don’t! 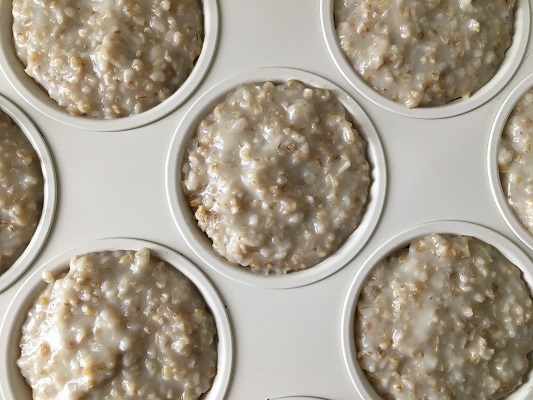 However, instead of reaching for the refined “instant” varieties of pre-packaged oats (that are often laden with sugary mix-ins), check out these make ahead techniques for preparing steel cut oats. They will transform the way you think about incorporating intact grains into your breakfast routine! But first, what is the difference between steel cut, rolled and instant oats anyways? 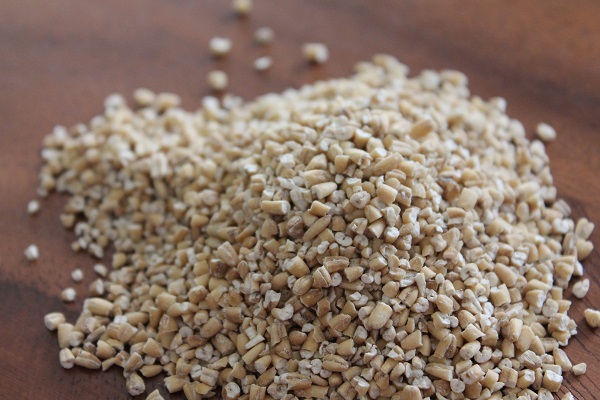 All oats start as oat groats (the unbroken, whole intact grain straight from nature). The type and amount of processing that then occurs depends on the type of oat. Instant Oats, or quick oats, are the most processed type of oats. They are considered a refined carbohydrate with very few nutrients left when it’s all said and done. They are pre-cooked, dried and then rolled and pressed slightly thinner than rolled oats. Instant oats cook the quickest and retain less of their texture, often ending up with a mushy consistency. Rolled Oats, or old-fashioned oats, are slightly less processed than instant oats. They look like flat, irregularly round discs and are first steamed to make them soft and pliable and then pressed to flatten. Rolled oats cook faster than steel cut oats, absorb more liquid and hold their shape relatively well during cooking. Steel Cut Oats, or Irish or Scottish oats, are the least processed type of oats. 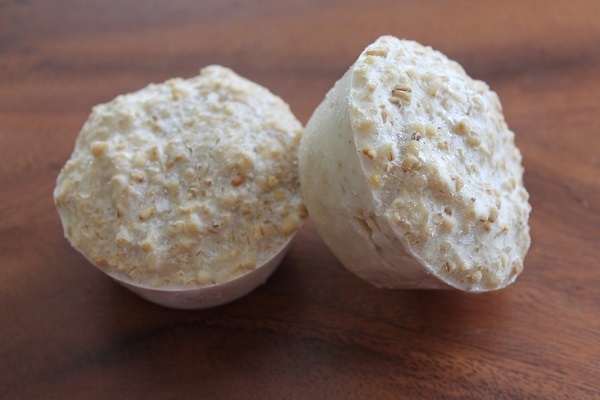 Whole oat groats are coarsely chopped, rather than rolled, giving the appearance of cut up rice. Steel Cut Oats take the longest to cook and retain much of its shape and texture after cooking, resulting in a chewy texture. So if the primary difference between steel cut, rolled and instant oats is simply the amount of processing that occurs (and the resulting variance in cooking time), which oat is superior? Steel cut oats! Each stage of processing chips away at nutrients and fiber, making the food incrementally less nutritious. Steel cut oats are one step away from nature (simply coarsely chopped versus steamed, rolled, steamed again and toasted) and have the lowest glycemic index (meaning they won’t spike and crash your blood sugars), making them the MVP of Oats! 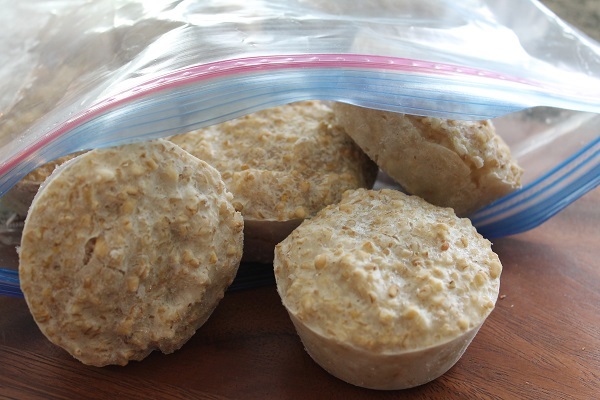 Allow oats to cool and then transfer cooked oats to a muffin tin. Each “hockey puck” will be approximately ¼ to ½ cup worth of cooked oats, depending on how much liquid is left in the oats. You should get approximately 16 pucks. Place in freezer and freeze until set, a few hours or overnight. Then remove from tin and transfer to an air-tight freezer safe bag or container. When you’re ready for breakfast, grab 2 “hockey pucks” out of the freezer and re-heat. I microwave them for about 2 minutes, stir and add liquid as needed, then heat for another 2 minutes or so. Then add mix-ins of choice (nuts, nut butter, fruit, coconut flakes, flax or chia seeds, protein powder, chia, etc). Directions: Heat 1 tsp butter or olive oil in a 2-qt saucepan or dutch oven over medium heat. Add oats and cook for about 3 minutes or until they start smelling toasty. Pour in 3 cups liquid and add salt. Stir. Bring to a rolling boil. Turn off the heat and cover the pan. Leave it on the stove and go to bed! The next morning, uncover the pan, add 1 cup liquid and bring it back up to a simmer (or reheat leftovers in the microwave). Add additional liquid, as needed, to reach desired consistency. Then add mix-ins of choice (nuts, nut butter, fruit, coconut flakes, flax or chia seeds, protein powder, chia, etc). Directions: Place all ingredients in a slow cooker. Cover and cook on low for 8 hours or on high for 4 hours. Then add mix-ins of choice (nuts, nut butter, fruit, coconut flakes, flax or chia seeds, protein powder, chia, etc). Directions: Mix oats, milk and yogurt in a medium-sized bowl. Add berries, cinnamon, and/or raisins (if desired) or just leave plain. Pour into an individually sized glass jar or storage container and refrigerate at least 4-6 hours or overnight. Then add mix-ins of choice (nuts, nut butter, fruit, coconut flakes, flax or chia seeds, protein powder, chia, etc). Note: To help soften the oats, microwave oats and milk for about 1 minute before adding yogurt. If you find the texture it still a little too crunchy for your taste, allow the oats mixture to sit at room temperature for a bit before eating. Double (or triple!) this recipe to have an easy breakfast later in the week. 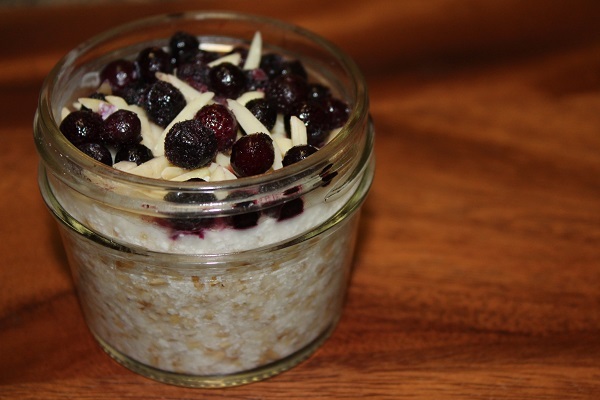 The overnight oats will safely keep in the fridge for up to 3 days. While steel cut oats naturally contain some protein (about 5gm per serving), it’s not enough to properly anchor a meal. Therefore, be sure to include an additional source of protein and/or fat with your oats. You can add 1-2 Tbsp of nuts, seeds or nut butters or a scoop of protein powder to the oats themselves AND/OR pair oatmeal with eggs or plain Greek yogurt for a balanced meal that won’t spike your blood sugars and leave you feeling hungry the rest of the day! 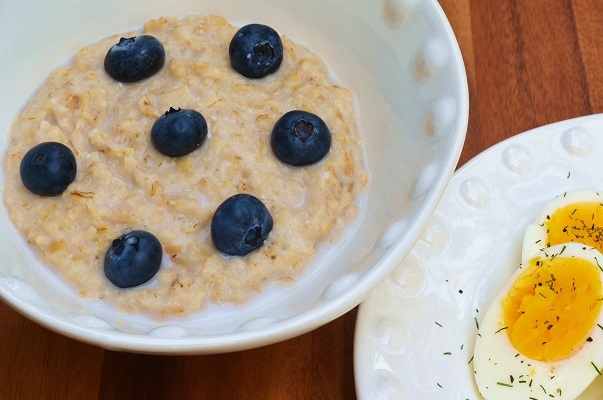 What’s your favorite way to enjoy steel cut oats? Click here for a printer-friendly version of this blog post.